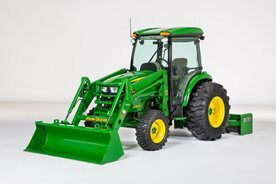 John Deere ComfortGard cab tractors are the most comfortable, quiet, and easy-to-use cab tractors available. This premium solution was developed using extensive customer research and validation, tools, and some of the most advanced design techniques available. 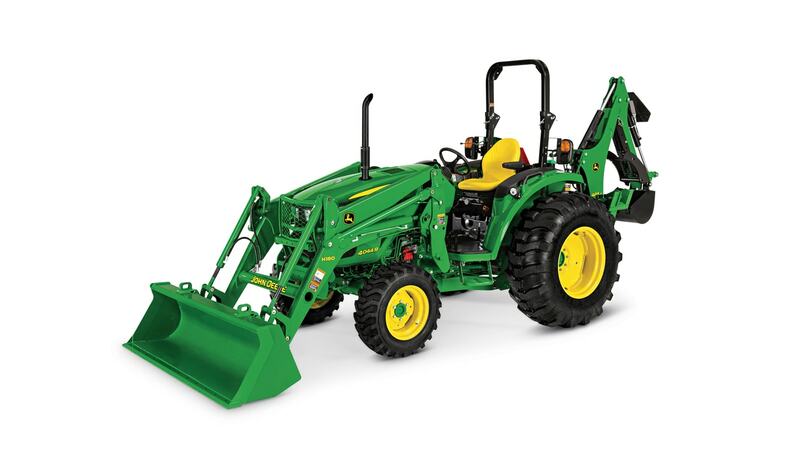 Whether using a loader to move dirt or remove snow or doing a variety of other tasks like mowing, tilling, rotary cutting, or light hay work, the cab tractors have the versatility and muscle to get the job done, all while protecting the operator from the elements. Operators are sure to appreciate what this cab has to offer – beginning with an isolated cab. 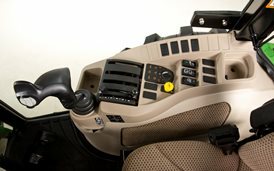 These cabs are designed with robust mounting points integrated into the rollover protective structure (ROPS) with a unique offset mounting design that provides an ultra-quiet ride. Operators will enjoy a commanding view no matter what task is being performed. The raised header bar design allows operators – whether short or tall – to see the loader bucket or pallet forks through virtually the full range of operation. Operator fatigue caused by awkward bending is reduced, leading to an increase in overall productivity. 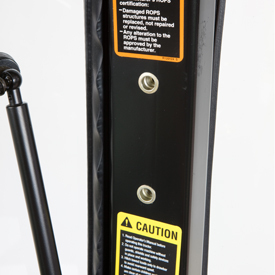 The slow-moving vehicle (SMV) sign can be easily removed and stored in the operator's manual holder to provide a clear and unobstructed view for attaching to implements and doing field work. 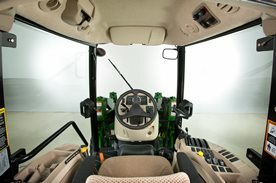 Ample headroom and curved glass on all four sides provide a spacious interior and give operators the feel of a large-tractor cab. The climate-control system makes any task more enjoyable whether on a frigid winter day or a hot summer day. The cab is tightly sealed to help reduce exposure to dust and allergens. Improved HVAC system with larger capacity condenser cools the cab faster in a hot climate. Jensen is a trademark of ASA Electronics Corporation. iPod is a trademark of Apple Incorporated. SIRIUS is a trademark of SIRIUS XM Radio Inc.
An ergonomically sculpted seat cushion, an adjustable scissor-link suspension, and seat armrests are combined to provide excellent operator comfort and support. The scissor-link suspension can be adjusted for the operator's height and weight. The operator weight adjustment adjusts to the operator's weight (115 lb to 275 lb). Seat is adjustable fore and aft for the operator's height, using the lever located under the seat. Retractable seat belts prevent the belts from becoming tangled in the seat suspension and controls. Optional air-suspension seat is available. An air-ride seat is standard on the 4066R Cab Tractor and is available as an option on the 4044R and 4052R Cab models. This seat is designed to provide an air cushion for vertical-seat travel which provides maximum operator comfort in any terrain. 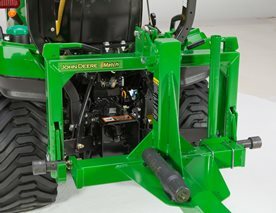 The deluxe air-ride seat is a field-installed option on the 4044R and 4052R Cab Tractor. The seat slides fore-aft with a lever on the right-hand side of the seat. The seat back reclines with the lever in the lower-left corner of the seat cushion. The optional field-installed air-suspension kit requires the existing standard seat to be reused when installed. NOTE: The deluxe two-piece seat top may be ordered through Parts. Easy-fold rollover protective structure (ROPS), with built-in, rattle reducing, tension rod. 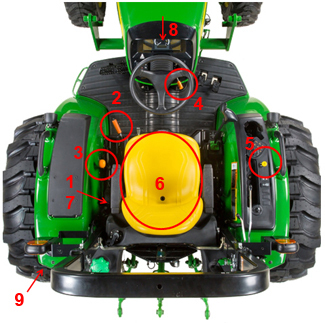 Swivel seat adjustment (1) with armrests, in base equipment on all 4R open station tractors, to decrease operator fatigue when operating rear driven implements. Seat swivels 15 degrees in either direction. 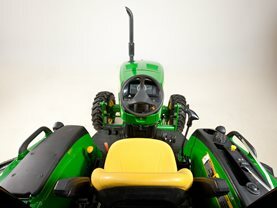 Also provides convenience and comfort while entering and exiting the tractor. 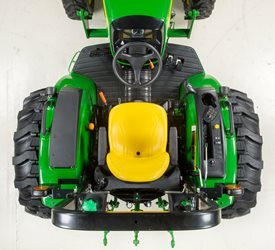 Air suspension seat optional for the 4R Series Tractors. Air suspension not compatible with swivel function. 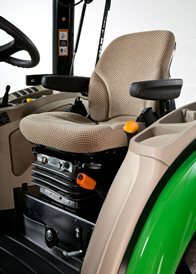 The scissor-type suspension seat gives the operator a comfortable ride. The seat flips forward for protection from the elements. 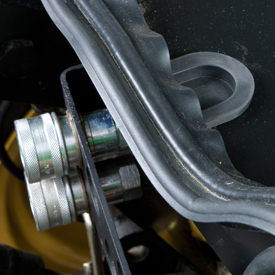 Retractable seat belts prevent belts from becoming tangled in seat suspension and controls. 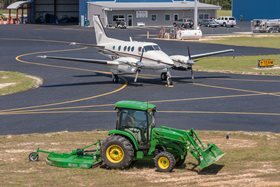 The optional field-installed 540/540 economy power take-off (PTO) allows operators to select the engine rpm needed for their PTO application. The economy position provides 540 rpm to the PTO at approximately 70 percent of the engine's normal rated speed. The engine runs at a rated speed of approximately 1750 rpm in the 540 economy position. 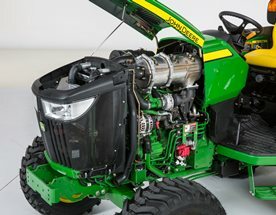 The 540 economy is ideal for any PTO application, from running a mower to a baler or a cutter, where full horsepower is not needed. 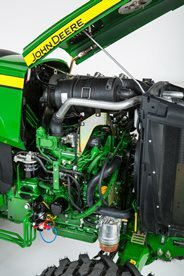 Operating at lower engine rpm decreases fuel costs during tasks. The overall operating experience improves because there is less noise and vibration for the operator. 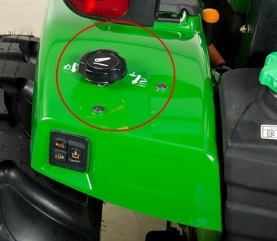 A conveniently located lever (behind the seat of the tractor) allows the operator to simply change between 540 and 540E when conditions merit the opportunity to save fuel without affecting performance. For heavy-duty operations that require maximum PTO power, the PTO shift lever is placed in the 540 position, the PTO engaged, and the engine is run at rated speed of 2400 rpm. 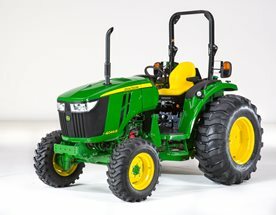 This selection gives 540 rpm to the PTO shaft and delivers the full-advertised horsepower at rated engine speed. downtime to fix implements or drivetrains. The eHydro convenience controls have been integrated into a single module. 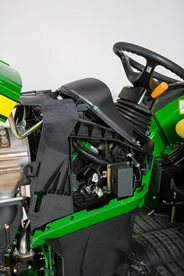 Combining features such as SpeedMatch™ LoadMatch™, MotionMatch™ eThrottle™ and automotive style cruise control pulls the maximum efficiency out of the eHydro transmission tractors. 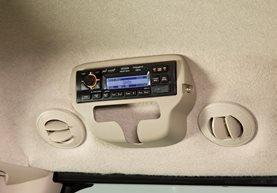 All of these features are standard on the 4R models, and deliver customers an easier and more comfortable experience. Press button to active/deactivate eThrottle. 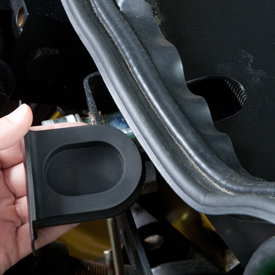 When eThrottle is activated, depression of the travel pedal increases engine RPM and tractor speed. Press button to active/deactivate LoadMatch. When LoadMatch is activated, engine will not stall during heavy load applications. Press button to activate/deactivate SpeedMatch. When SpeedMatch is activated, operator is able to set the desired maximum travel speed. Press button to activate/deactivate cruise control. When cruise control is activated, operator is able to set cruise speed. Press button to set cruise speed, or to decrease cruise/set max speed. Press button to resume set cruise speed, or to increase cruise/set max speed. MotionMatch - longer accelerate and decelerate distances. MotionMatch - shorter accelerate and decelerate distances. Press a button to activate/deactivate eThrottle™. 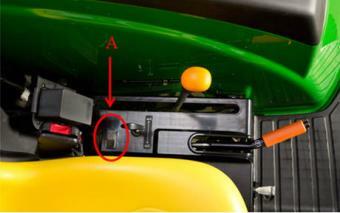 When eThrottle is activated, depression of travel pedal increases engine rpm and tractor speed simultaneously. 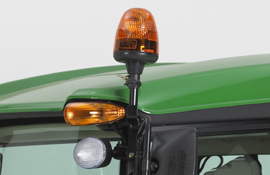 This provides the operator with comfort and convenience as well as fuel economy. 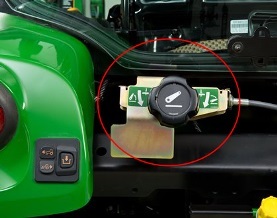 An automotive-style cruise control is standard equipment on the 4R Series Tractors. Cruise control is electronically engaged and disengaged and is located on the right-hand operator console. 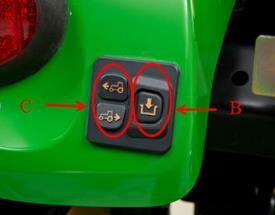 LoadMatch is a standard feature on the 4R Series Tractors. 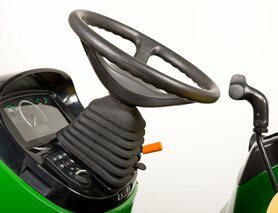 The MotionMatch, standard on the 4R Series Tractors, is located on the right-hand console. 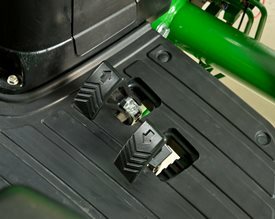 It offers seven settings for adjusting the rollout or decelerating when the pedal is released. Longer accelerate and decelerate distances. Shorter accelerate and decelerate distances. 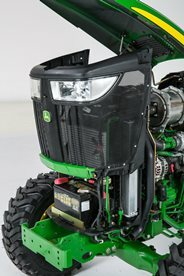 SpeedMatch, standard on the 4R Series Tractors, further enhances the eHydro cruise control functions by allowing the operator to preset maximum speed. 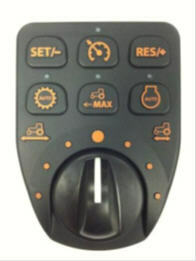 Once this feature is engaged, the operator must stroke the travel pedal fully to meet the operator’s preset speed and press the Set button to lock the speed. 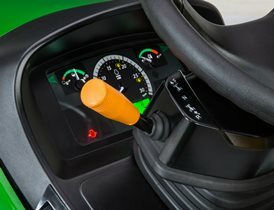 From there, the operator can use the automotive-style cruise controls to adjust speed. This function will improve accuracy and safety, particularly at lower travel speed applications. Sauer-Danfoss is a trademark of Sauer-Danfoss Incorporated. 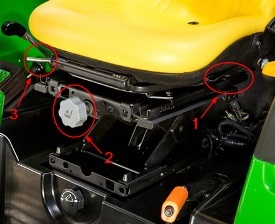 The new auxiliary 3-point hitch control, on the left-hand fender, allows the operator to raise or lower the hitch while standing on the ground behind the tractor. 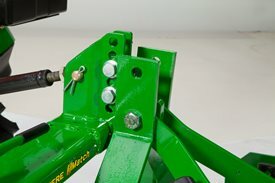 Pairing the auxiliary 3-point hitch control with hitch assist, changing implements has never been easier. 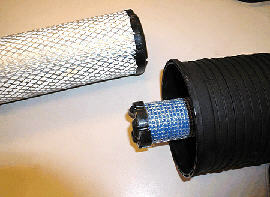 Both features are in base equipment for 4R Series eHydro™ models.